The book: Five Hundred Buddhist Deities is intended to present a reproduction of Five Hundred Deities of Narthang in an enlarged size. Here in this book each square of a folio is separated and enlarged together with the mantra of each deity. In the fifteenth regnal year of the Manchu emperor Chia ch'ing, i.e., in 1810, the Imperial Treasurer Blo bzang dkon mchog and others requested the Fourth Panchen Lama to initiate them into the great Mandala of the First Buddha by giving the four Kinds of Tantric consecration rites. 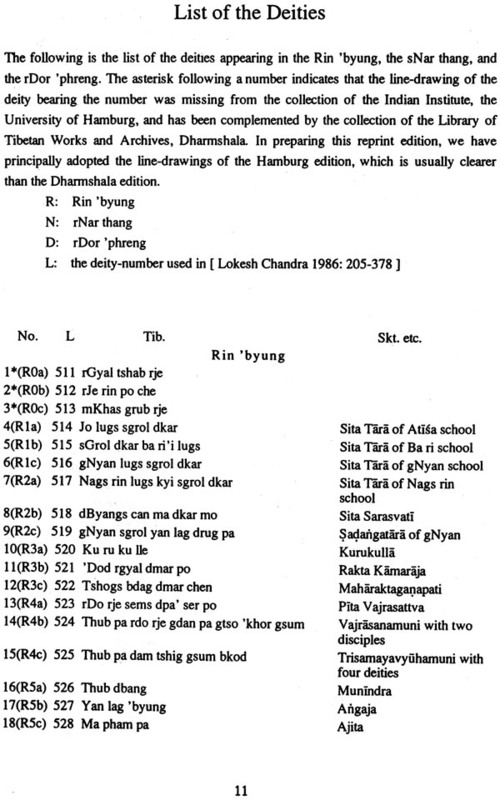 On this occasion the Fourth Panchen Lama and used the book named Rin Ihan as the basic text for those rites. 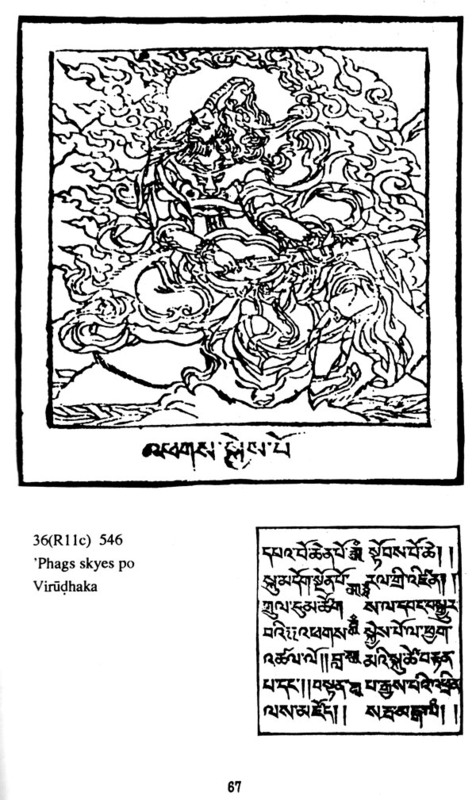 He was further requested to publish the wooden prints of the images of the deities described in the text. 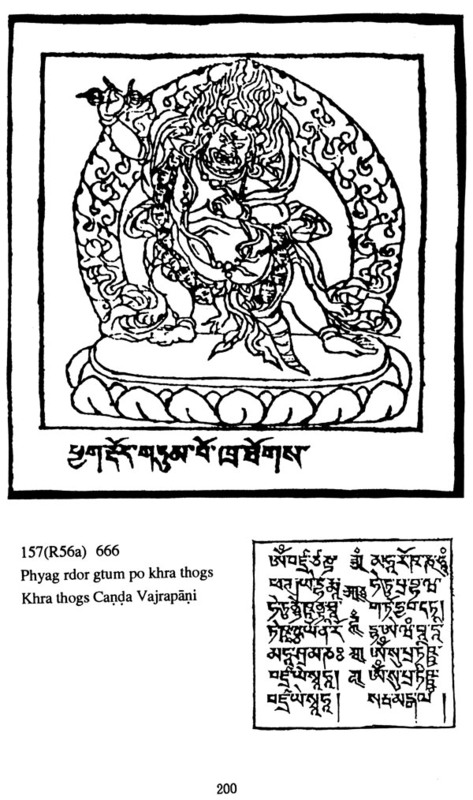 This enlarged edition of Five Hundred Deities of Narthan is based mostly upon the set of prints preserved at the Indian Institute, the University of Hamburg and partially upon the set kept at the library of Tibetan Works and Archives, Dharamshala. Recently, interest in Buddhist iconography has been increasing reamarkably. 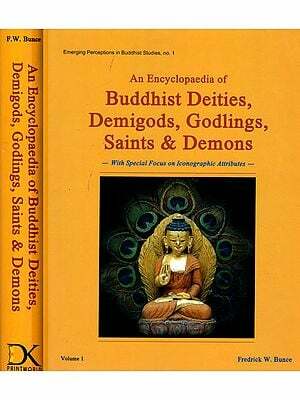 This book will furnish high quality of materials for the study of Buddhist iconography. Musahi Tachikawa (Ph.D., Harvard University ; D. Litt., Nagoya University (1985) formely taught at Nagoya University (1970-92) and is now professor at the National Museum of Ethnology in Osaka, Japan. His publications include the Structure of the World of Udayana's Realism (Reidel, 1980) and "A Hindu Worship Service in Sixteen steps, Shodasa –upacara –puja" (Bulletin of the National Museum of Ethnology, 8.1 ). An Introduction to the Philosphy of Nagarjuna, tr. By R. Giebel (motilal, 1997). 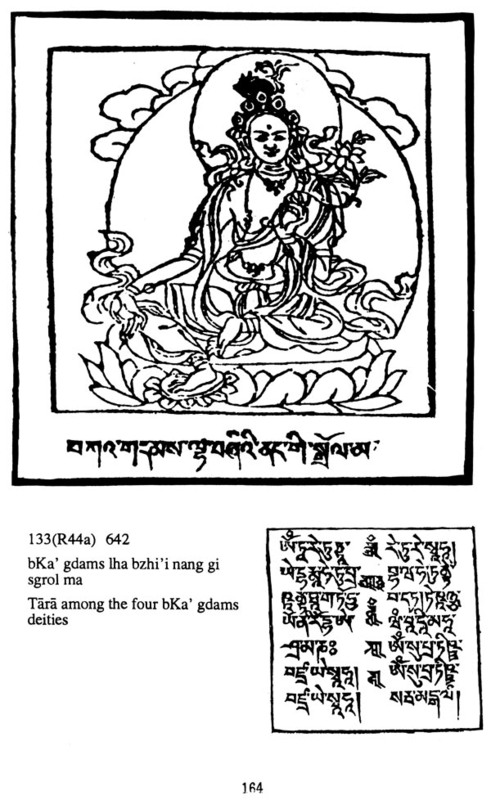 Tibetan Buddhist scholars compiled a number of collections of Buddhist iconography. 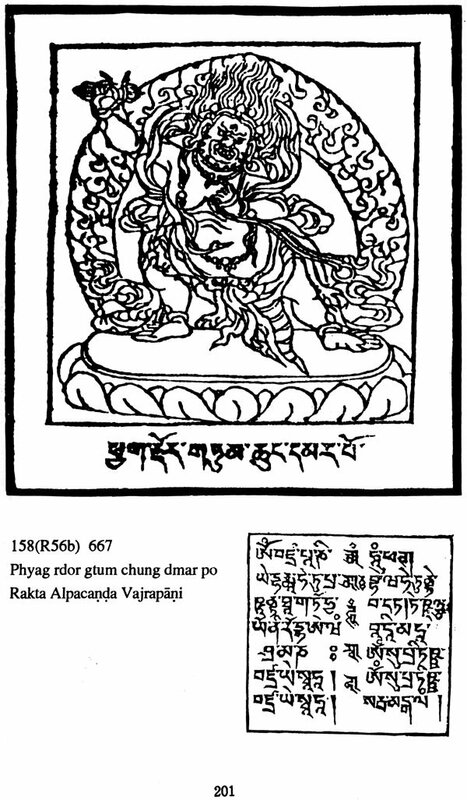 Among those, the so –called "Five Hundred Deities of Narthang" (Rin 'bhung rhar thang rgya rtsa) is one of the most important collections. It consists of about one –hundred seventy folios, each of which is divided into three squares. In each square (6.2 X 6.2 cm size) one or a few Buddhist deities are depicted with soft and fine lines. 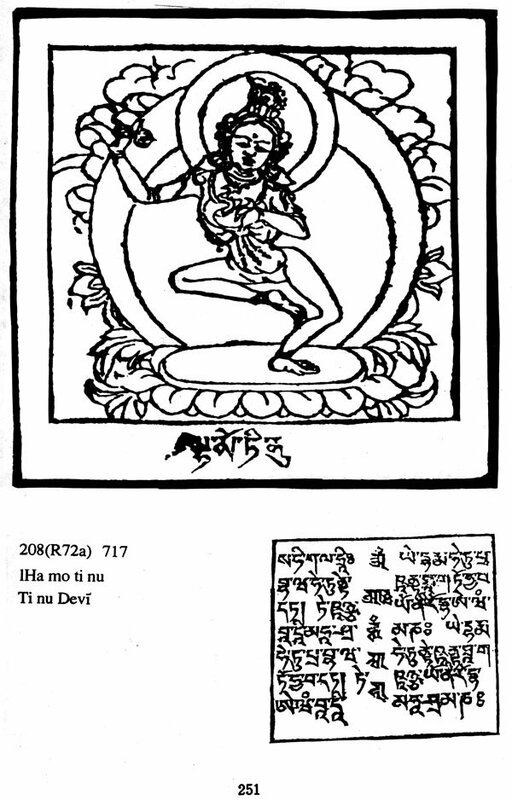 From the fall of 1979 up to the fall of 1980 I had the chance to conduct a research at the Indian Institute, the University of Hamburg, where I found a set of wooden prints of line –drawing of Tibetan Buddhist deities. The set consists about one hundred seventy folios, each of which is divided into three squares. In each square (6.2 – 6.4 X 6.2 – 6.4 cm in size) one or a few Buddhist deities are depicted with soft and fine lines. At first glance, I was fascinated with the fine techniques of wood engraving. 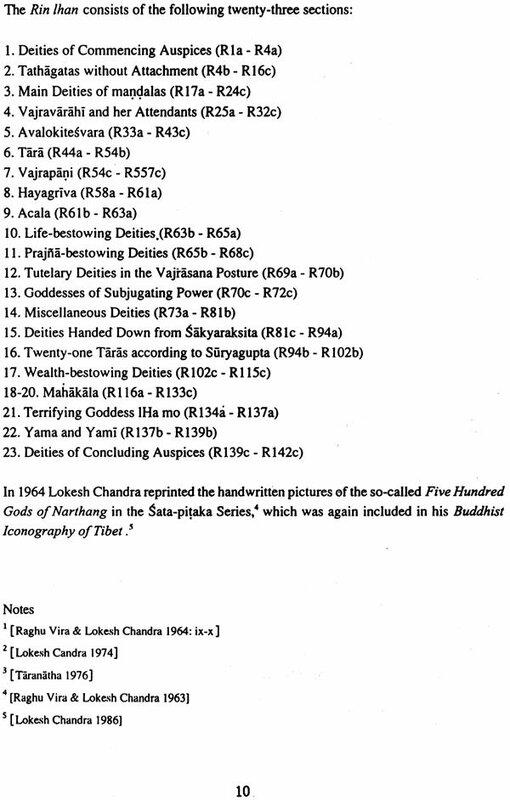 With the permission of the Indian Institute, the University of Hamburg, I made a xylographic copy of the iconograhical set of Tibetan Buddhist deities. A short time later I learned that the set of the line-drawings was the so –called Five Hundred Gods of Narthang. 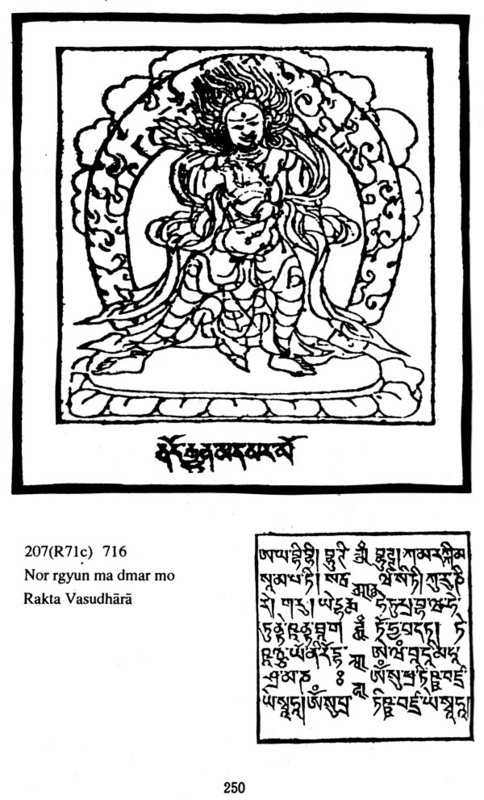 In 1964 Lokesh Chandra published handwritten pictures of the Five Hundred Gods of Narthang (A New Tibeto –Mongal Pantheon, Part 9), a xylographic copy of which Raghu Vira was given by a Tibetan priest in Ulanbator. The set preserved at Hamburg, however, lacks eight percent of the complete set. 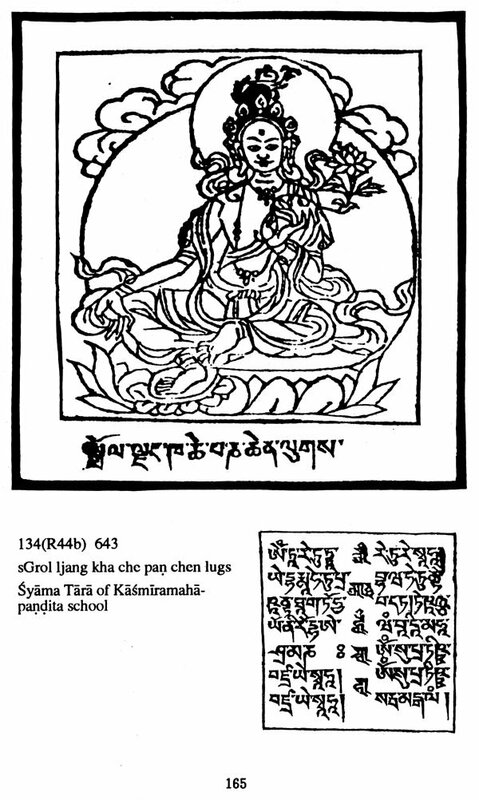 After I came back to Japan, I fortunately obtained the missing folios of the Five Hundred Gods of Narthang through the kindness of the Library of Tibetan Works and Archives, Dharmshala. Recently interest in Buddhist iconography has been increasing remarakbly. The wooden prints of the Five Hundred Gods of Narthang furnish high quality of materials for the study of Buddhist icnography. This volume is a result of a research project of the National Museum of Ethnology entitled "Studies of religious iconography in South Asia"(headed by M. Tachikawa, 1992 -1994). 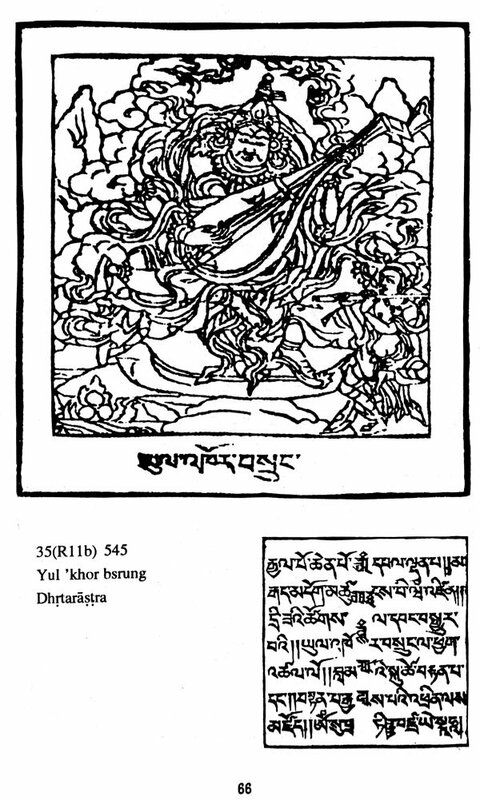 Here I would like to express my deepest gratitude for giving us the permission to reprint the copy of the Five Hundred Gods of Narthang to the Indian Institute, the University of Hamburg, and the Library of Tibetan Works and Archives, Dharmshala. I also would like to thank Mr. rGya mtsho rtse rin, Director, the Library of Tibetan Works and Archives, Dharamshala for sending the films of the Five Hundred Gods of Narthang. Last but not least, I would like to thank Mr. Taiji Oya, President, Mandala World Cooperation, who took great pain to help me obtain the films from Dharamshala. In the fifteenth regnal year of the Manchu emperor Chia ch'ing, i.e., in 1810, the Imperial Treasurer BLo bzang mchog, Chin wang Phung tshog rdo rje together with his son and ministers, and No yon sprul sku Ratnadhvja requested the Fourth Pan chen bLa ma bsTan pa'i nyi ma phyogs las mam rgyal to initiate them into the great Mandala of the First Buddha (dang po'i sangs rgyas to dkyil 'khor chen po) by giving the four kinds of tantric consceration rites: the preliminary abhiseka ('jug pa'i dbang), the higher and still higher abhisekas (gong ma gong chen gyi dbang) and the mahavajracarya abhiseka (rdo rje slob dpon chen po'i dbang). At their request, the Fourth Pan chen bLa ma gave the four kinds of consercration rites to hundreds of laymen and monks. (3.) rDor 'phreng (ff. 1-20). The first part, i.e., Rin 'buying is based upon the Rin Ihan, the second, rNar thang, is an appendix to the Rin Ihan, and the third, rDor 'pheng, is based upon Abhayakaragupta's Vajravali and ICang Skya Nga dbang blo bzang chos ldan's rDzogs 'phreng dang rdor 'phreng gnyis kyi cho ga phyags len gyi rim pa lag tu blangs bde bar dgod pa. Each folio contains three squares, and in each square a deity is depicted. The reverse side of each square has the mantra of the deity. The following two pages show the folio 33 of the Rin 'buying of the original size(cf. pp. 131-133).